However, clearing continued after the big fire when the vegetation are not fully burned. Yeah, it like half-cooked thing. Blamed it on moist leaves and unpredictable rains. Bidayuh ladies would then collect small twigs and pull out unburned plants and lumped it together and burned them separately. 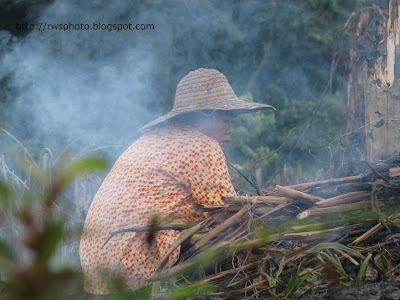 It's like a lot of mini bon-fires (called "tabun" or "bertabun" in Bidayuh) in the farm and it's a lot of work. Where there is smoke, there's tabun. 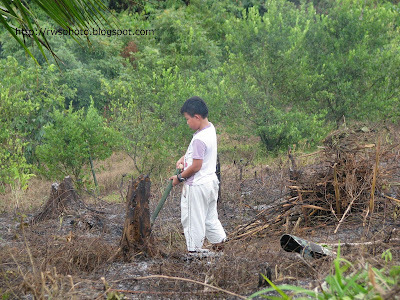 Bidayuh kids also help and they like to have fun, torching the dead stumps and twigs. However, kids are not allowed to be in the burning zones for too long because it is heaty and smoky and not good for their health.